The sort of formidable true story that nevertheless doesn’t generally make it into the textbooks handed out during history classes, A United Kingdom centers on the difficulties encountered by a loving couple whose different skin colors meant they had to deal with an astonishing amount of societal prejudices. 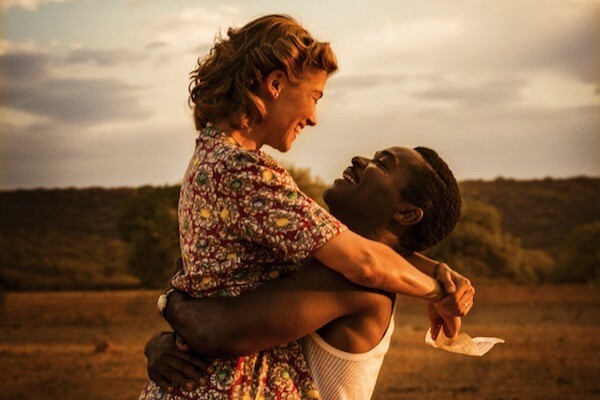 David Oyelowo, terrific as Martin Luther King in Selma, here plays another crusader for equal rights: Seretse Khama, a prince who in the 1940s journeys from Bechuanaland (now Botswana) to England to further his education before he returns home to claim the mantle of king. While in London, he meets and falls in love with Ruth Williams (Gone Girl’s Rosamund Pike), a secretary who returns his affection. The two plan to wed, a decision that not only upsets Ruth’s parents but also Seretse’s kinfolk, who bristle at the thought of a white woman becoming queen of their country. The proposed union also faces the wrath of the British government, whose members are outright antagonistic since they’re playing nice with a South Africa that has just recently adopted a policy of apartheid. The first section of A United Kingdom is the strongest, since the personal problems faced by the couple are more delineated than the political ones that tend to blur during the latter segments. And, as is often the case with historical sagas, the picture relegates lots of fascinating material into a few blocks of text at the end, giving short shrift to the subsequent accomplishments of two people who refused to be defined merely by their physical appearances. Overall, though, director Amma Asante (Belle) and scripter Guy Hibbert (Eye in the Sky, which made my 10 Best for 2016), working from Susan Williams’ book Colour Bar, have presented a compelling piece that serves as a welcome reminder that, even in the direst of situations and in the most impossible of times, love can indeed trump hate.